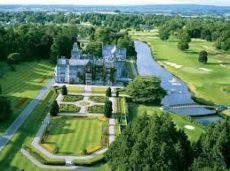 Located one hour drive away is the Twice Irish Open Course of Adare Manor. Designed by Robert Trent Jones of the USA is it his best creation in Ireland using all the natural lands available to him including the River Maigue to its level best. In my personal opinion it is without dough in the top three Parkland courses in Ireland for as many years. The Adare Manor golf course is probably one of the finest Parkland courses in Ireland no question. From the opening hole at Adare Manor this is a good as it gets to the 9th hole par 4 as you play into the view of an Irish Castle warms you into the feeling of grandeur. Nothing prepares you for the back nine where the 12th,13th and 14th is my Amen corner the finest three holes personally I believe on this course. With the river Maigue as recognized as one of Ireland’s best Trout rivers flowing through the course and the Adare Manor Castle estate what a setting for the National Irish Open Golf as won by Irishman Padraig Harrington in a dramatic shootout finish that captured the hearts of all golfers not only in Ireland but all over the world. An 18-hole Championship Course, it was opened in 1995. The exquisite parkland of the Manor demesne has been preserved with the challenging course set amid magnificent mature trees and incorporating many aquatic features including a 14 acre lake anchoring the front nine holes and The River Maigue which meanders through the entire golf course. Situated only 25 minutes drive from Shannon Airport and two hours drive from Dublin, Adare Golf Club is ideally located. The course measures 7,453 yards and uses 230 acres of lush Irish countryside. The course record of 64 was shot by Lee Westwood during the Irish Open 2008. Adare Golf Club has been Voted Number 1 Parkland Course in Ireland in 2006, 2007, 2008, 2009 & 2010 by Golf Digest Ireland Magazine. Voted Number 1 Golf Resort in Ireland by Condé Nast Traveller Magazine in the 2005 & 2006 readers poll. Twice Irish Open Winner Padraig Harrington Signing autographs at Adare Manor. Adare Manor Golf Club Green fees are 100 Euros a person for 2013 season High Season. Call or e-mail today for low season rates and special offers. Or conbine both course with Ballybunion and Adare Manor Golf Club Vacation Packages. Ballybunion Golf Packages are available through this web site. This guarantees your Old Course Golf Times and accommodation in one simple e-mail. Please call 0866000665 where we would be happy to accomodate your golfing trip.